This week I am joining in 25+ other KBN bloggers to share our Top 10 Learning Lists with you. I couldn’t be more excited! We will be sharing all week long, so make sure to check back! You can click here to view all the summer learning topics. My kids are counting down the days until Summer Vacation begins and so am I! There is nothing better than having a full summer packed full of quality time together. We love being alarm clock free and take full advantage of our flexible scheduled. However, I still want to be intentional about giving the kids opportunities to learn and grow over the summer. That is why I am so excited to be a part of this Top 10 learning series. Top 10 Ways to learn with Paint! 2. Weather and Paint ~ Kids love learning about weather and how it effects us each day. Take your kids outside and try painting in all different types of weather to see how it effects their finished piece. 5 fun ways to Paint in the Rain ~ grab your rain gear and head outside to paint in the rain. Ice Paint ~ perfect way to stay cool on a sunny day. Watch the sun melt your ice and create a beautiful master piece. 3. The Listening Game ~ this game is great for reinforcing listening skills and the importance of following directions. Each child will need a sheet of paper, paint brush and a pallet of paints. Give simple instructions/directions on what to paint. I love drawing right along with the kids (although I often cover my paper so they can’t see what I am drawing). It is important to remember to only give one set of instructions at a time. For example, you could describe to the kids how to draw a Robot. You could say “paint a large grey square in the center of your paper. Now paint a smaller grey rectangle on top of the large square. Paint 2 blue curly lines moving away from the large square. At the end of each curly line paint a red circle…” Continue describing how to paint your robot until the master piece is finished. The kids will get a kick out of how silly each one looks. This game works especially well with a group of 2 or more kids following the same instructions. Continue playing, only this time have one of the kids describe what to paint. 4. Science and Paint ~ Kids are amazed by science, so we combined a little paint and a little science to create fun art! Check out these great ideas on how to bring a little science into your painting this summer. Exploding Art ~ This is by far my kids favorite painting activity that we have done. I love that our whole family got involved. Learn how to make a film canister fly into the air, and see the effects of the explosion in paint. Fluffy Bathtub Paint ~ Your kids will love this simple recipe. The best part (according to my kids) is the simple science experiment that you do to create this amazing bathtub paint. Microwave Puffy Paint ~ A simple squeeze paint recipe that your kids will love. Then amaze them by placing their creation in the microwave for a few seconds. My kids could not believe what happened to their painting when it came out of the microwave! Raised Salt Painting ~ You kids will love watching the paint travel along the salt. Simple recipe that is a little art and a little science! 5. Sensory paint ~ Paint is a great way to explore your senses. Touch, feel, smell, sound and taste can all be explored through paint. Dancing Oobleck ~ This is a great way to show kids how sound waves work. Why not turn on the music and paint what you hear. You might be surprised by the results. Switch up what you are listening to so see the difference. There are lots of edible finger paint recipes out there. This is perfect for litter kiddos that still want to put everything in their mouth. Cleaning with shaving cream ~ shaving cream is the perfect medium to squish through you fingers and toes. the best part about it is the kids will be cleaning as they are playing. Great way to clean all those messy art trays! Painting with Spices ~ this is a great way to use up old spices and create a wonderful sensory experience for your kids. They will love how the paint smells. 6. Color Mixing ~ Place a pallet of primary colors in front of your child along with a black piece of paper. No need for anything fancy:) Challenge your kids to see how many colors they can create or challenge them to make a specific color. If you are working with younger kids, simply invite them to discover what colors they can create. You can also use ice cube trays or muffin tins filled with colored water and use an eye dropper to transfer the colors around. 7. Painting without Brushes ~ Paint with new tools and discover what type of marks they leave behind. Leave the brushes in the cupboard, and try some of these fun and new ways to discover your child’s inner artist! DIY Spin Art Machine ~ Create your own spin art machine with a few simple items from around the house. Q-tip Painting ~ Simply replace the brushes with q-tips and see what the kids create. Mess Free Finger painting ~ perfect for those days when little ones want to paint, but you have no time to clean up a huge mess. Credit Card Art ~ Lots of scraping and painting can happen with all those used up gift cards, hotel room keys etc. Marble Painting ~ My kids love rolling a marble in paint and seeing the cool tracks it leaves behind. Use an oatmeal container to contain the mess. Painting without Brushes Pinterest Board ~ love for you to follow along with our collaborative board that is all about getting creative with how we paint. Lots of fun and unique ideas are being shared! 8. Read a book and then paint what you heard ~ This is a fun way for kids to make connections with the book that they are reading. It is a great way to encourage your kids to be imaginative and pay attention to details. Could work great with a favorite book, or one that you have only read once. Not only is it encouraging your kiddos to read, but also to listen, and use their imagination. 9. Paint with Air ~ We can’t see air, but we can observe it effects on things around us. Here are some fun ways to explore air with your kids and see how wind works. Bubble Painting ~ This is a favorite in our house. There is nothing better than making amazing bubble prints on a paper. All created by you blowing air into a solution of paint, soap and water. Painting with Balloons ~ Simple techniques that use the air from inside the balloon to paint with. My kids love this. Painting with Straws ~ Use a straw and blow paint around on your paper. Great technique for creating beautiful blossoming tree, or a silly monster. 10. DIY Paint Recipes ~ Store bought paints are convenient, however it is fun to teach your kids that they can actually make their own paints right at home. Art Recipe Pinterest Board ~ this board is packed full of fun DIY recipes that are prefect for creating with your kids. You might be surprised at how many mediums can be created at home. Why purchase it if you can make it at home? I would love to hear how you keep your kids engaged over the summer and if you have any tricks and tips for using paint to teach your kids. Here is the list of the other KBN blogs that are participating! 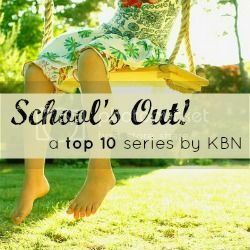 You will want to hop on over and check out their Top 10 Ways to keep kids learning while school is out! There are lots of great ideas that I can’t wait to use with my own kids this summer! Posted in Kid Art and tagged Kid Art, Painting.